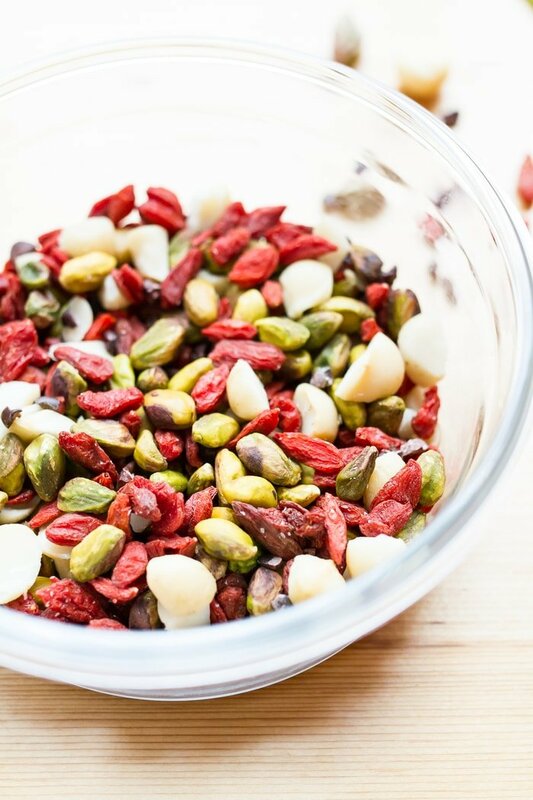 Snack healthy with this crunchy, vibrant pistachio trail mix. It’s a delicious blend of roasted pistachios, macadamia nuts, goji berries and cacao nibs. 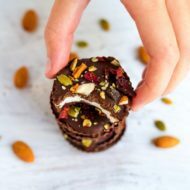 Vegan, gluten-free, low sugar and low carb! 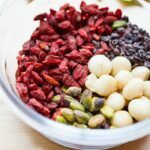 I know I’ve talked about this before, but I’m a trail mix fanatic! The whole idea for my blog name actually came from me snacking on trail mix nonstop in college. 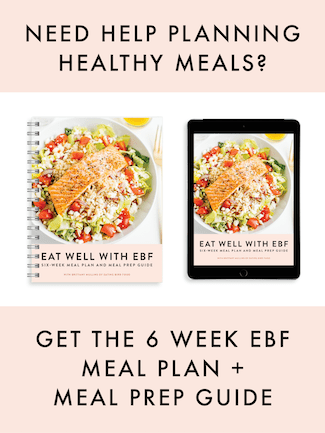 My roommate always said I was eating bird food and a few years later when I was brainstorming blog names, the bird food idea came up and it stuck. It fits! The winning creation will be featured on the Nuts.com blog and the Nuts.com team will send the winner a package of the trail mix they create! Pretty fun, right? To enter, all you have to do is share your trail mix recipe on your blog before August 29th. 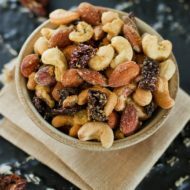 Once your post is live, tag Nuts.com and use the hashtag #nuttytrailmix on any social media platform with a link to your trail mix post so they can check it out. 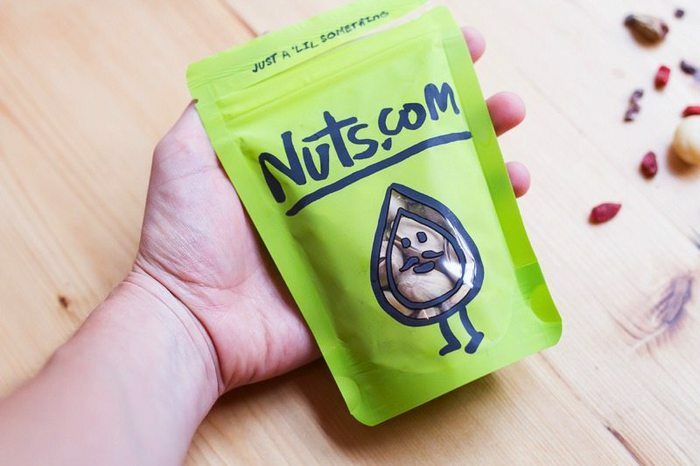 PS – I have to brag about Nuts.com because I’m hooked on their site for a variety of reasons. They seriously have every nut, seed, candy, spice you could ever possibly want, you can design your own custom trail mix AND they carry my absolute favorite Mango Goji Fire Sprouted Trail Mix. My local Whole Foods actually stopped carrying it so I’m absolutely thrilled to know I can get it through Nuts.com now. My entry into the trail mix recipe contest is this pistachio trail mix with roasted pistachios, rich macadamia nuts, chewy goji berries and raw cacao nibs. 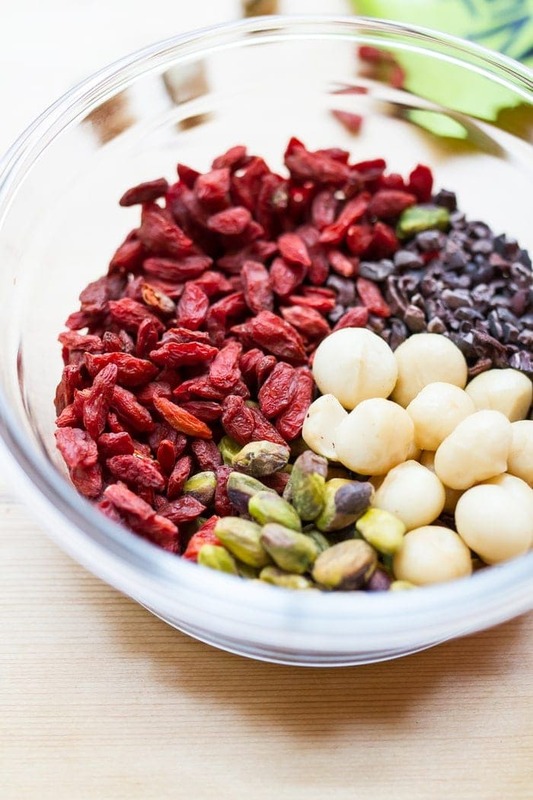 It’s a colorful superfood snack that’s low in sugar (and carbs)! The best part — it takes about 5 minutes to whip up and you can bring it with you anywhere. Woot! I’m actually eating some as I write this post and I have to admit that it’s pretty darn good. The combo of turned out even better than I expected. 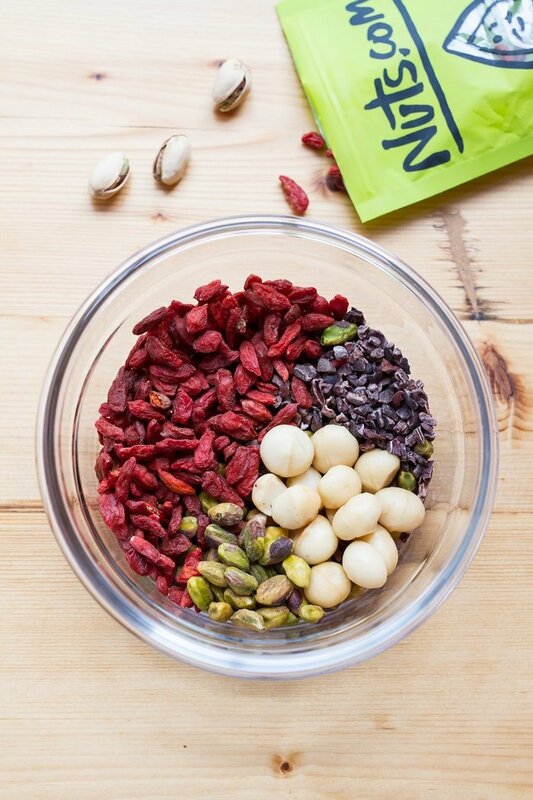 The goji berries and cacao nibs add just the right amount of sweetness and the pistachios and macadamia nuts give it that crunch factor! I honestly never think to buy macadamia nuts, unless I’m making this amazing macadamia nut milk, but now that I’ve tried them in this trail mix I might be using them more often. They’re so rich and creamy. 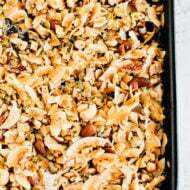 If you like this trail mix recipe, you can also explore my roundup of trail mix recipes. 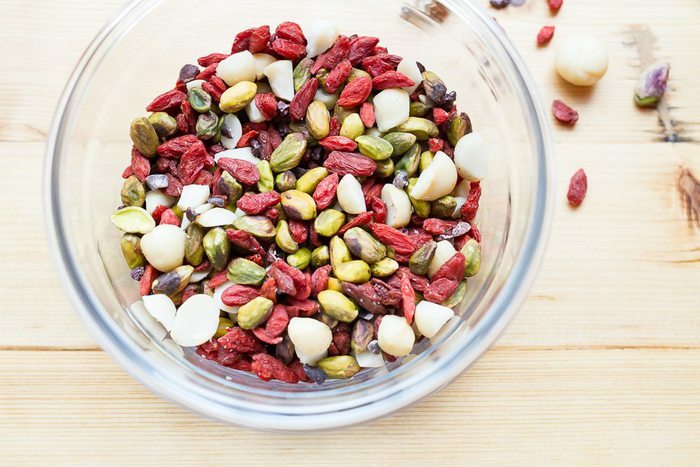 Snack healthy with this crunchy, vibrant pistachio trail mix. It’s low in sugar and carbs! Chop macadamia nuts if needed. Combine all ingredients a small bowl and enjoy! This post is sponsored by Nuts.com. As always opinions are my own. Thank you for supporting the brands that make EBF possible. I absolutely LOVE nuts.com! And trail mix is definitely my addiction! Trail mix is one of my favorite snacks. It’s portable and easy to eat while on the go. This is a really neat recipe contest! I hope to submit something soon. Do we tag them on a different platform to let them know we’ve submitted our entry? Hi Kori! You can tag us on any social media platform with a link to your trail mix blog post. I look forward to your entry! Okay thank you! Looking forward to sharing soon! Great job Brittany! This trail mix looks amazing–can’t wait to see the other submissions we get! Feel free to reach out to me via email (christine@nuts.com) for additional details or clarification. That’s really cool that you can make your own custom trail mix through their website! The best thing about this snack is that it’s great for “grab and go” and takes less than 2 seconds to put together. So convenient! Can’t wait to see your recipe, Christine! I love pistachios. Can’t get enough. It is in my cart – now what???!!!!!! thank u for your help! Hi Rosie. Where do you have items in your cart, nuts.com? yes. Is this the current contest? b/c the post on nuts.com is from a while ago. I now see your directions above, but when I see it was an old post that already ended, now not sure! your help much appreciated. Hi Rosie! Unfortunately the contest entries needed to be in by August 29th. ok. there is a new post on nuts.com and I got mixed up! thank u for responding.